Monsanto Co, the world's biggest seed company, threatened to pull out of India on Friday if the government imposed a big cut in the royalties that local firms pay for its genetically modified (Bt) cotton seeds. Mahyco Monsanto Biotech Ltd (MMBL), a joint venture between Maharashtra Hybrid Seeds Co and Monsanto Investments, is unhappy with the reported recommendations of a government-appointed committee to cut the 'trait or licence fees' on Bt cotton seeds by over 70 per cent for 2016. "If the committee recommends imposing a sharp, mandatory cut in the trait fees paid on Bt cotton seeds, MMBL will have no choice but to re-evaluate every aspect of our position in India. It is difficult for MMBL to justify bringing new technologies into India in an environment where such arbitrary and innovation stifling government interventions make it impossible to recoup research and development investments focused on delivering extensive farmer benefits and where sanctity of contracts is absent," said Shilpa Divekar Nirula, CEO, Monsanto India Region. She said such a drastic intervention overrides existing private bilateral commercial contracts, and undermines the overall operating environment in India. 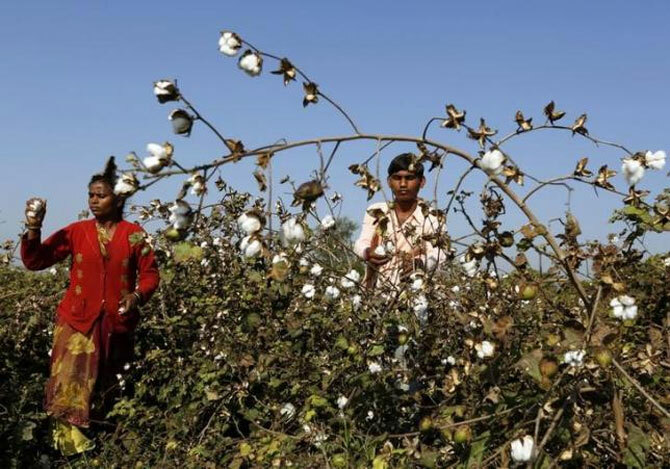 Monsanto threatens to re-evaluate India biz over Bt cotton row The Centre had in December issued an order to control cotton seed prices including trait or royalty value, effective from 2016-17 crop year. A committee under the agriculture ministry has been set up to recommend the seed price along with royalty fee soon. The committee, officials said, has suggested a price of Rs 800 per 450 g of Bt cotton which also includes Rs 49 as trait fee or licence fee. The trait fee is more than 60 per cent less than the current rate. At present a 450 g packet of Bt cotton is sold at around Rs 830 in Maharashtra, while in Karnataka, Andhra Pradesh, Telangana, Gujarat and Tamil Nadu it is sold at Rs 930. In the northern states of Punjab, Haryana, Rajasthan etc it is priced at Rs 1,000. MMBL currently charges trait fees of Rs 122.96 and Rs 183.46 per packet of Bt Bollgard-I and Bt Bollgard II seeds, respectively. The retail sale price recommended by the committee which held its last meeting few days back is almost 25 per cent less than highest prevailing price of Bt cotton in northern states, while it is around 14 per cent less than the price which prevails in areas where Bt cotton sales are the highest. "We have taken a decision which is in the best interest of farmers and have tried to strike a balance between the interest of seed companies and also license providers," a senior government official said. He said the committee's recommendations are not binding on the government and a final call on the same will be taken by the agriculture ministry. Monsanto India CEO Shilpa Divekar said, "If the committee recommends imposing a sharp, mandatory cut in the trait fees paid on Bt cotton seeds, MMBL will have no choice but to re-evaluate every aspect of our position in India"
MMBL had challenged the order in Delhi high court. MMBL has sub-licensed Bt cotton seed technology since 2002 to various domestic seed companies. "It will be difficult for MMBL to justify bringing new technologies into India in an environment where such arbitrary and potentially destructive government interventions make it impossible to recoup research and development investments focused on delivering extensive farmer benefits and where sanctity of contracts is absent," she said. Noting that certain reports in the public domain are false, Divekar said, "We sincerely hope that the government will be fair in its approach." 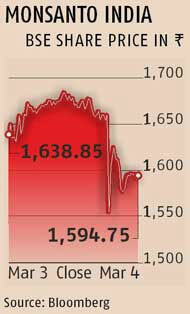 Shares of Monsanto India dropped as much as 7 per cent to a near 2-year low before ending down 2.4 per cent. The Association of Biotech Enabled Enterprises Agriculture Group too hit back at the government over the reports of lower the trait price. "By slashing trait fee, which is anyway the lowest in the world and is 1-2 per cent of the cost of cultivation, the government will showcase that it will go for short term populist measures rather than supporting innovation in the long term. Such a decision, if true, will be contrary to the Prime Minister's vision of encouraging R&D, respecting IPR in agriculture and Make in India," said Shivendra Bajaj, executive director of the group. The government's cotton seed order comes against the backdrop of a bilateral dispute where few licensees refused to honour their commitments to pay MMBL, over Rs 450 crore (Rs 4.5 billion) after collecting these amounts from the cotton farmers in Kharif 2015. Meanwhile, competition watchdog CCI has ordered a detailed probe against MMBL for alleged abuse of dominance by the Indian arm of the US-based genetically modified seed giant Monsanto.